This issue looks primarily at the topic of depression. At a time when depression rates are rising, it seeks to answer the question of how we can help address the common issue of recurring episodes. 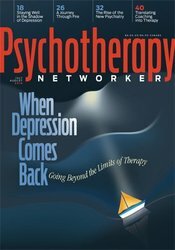 Other articles focus on how to help couples in therapy provide corrective emotional experiences for each other, the benefits and limits of bringing a coaching style into your practice, how to help people-pleasing clients feel more entitled to set boundaries, and a practical approach to helping people navigate racial conversations and encounters with self-awareness and mindfulness. Describe Wachtel’s perspective on addressing individual issues in couples therapy. Explain Grodzki’s view of the clinical implications of bringing coaching elements into therapy. Articulate Muñoz’s view of boundary setting as it relates to clinical treatment.